I found my copy of “THE BUDDHIST FIST” in the back of an oddball used goods store in Seattle, sometime in 2001. At the time I was a touring musician, so my days consisted of either driving from one town to the next, or wandering aimlessly through the downtown of some city, waiting till it was time to head to the venue for soundcheck. We got into Seattle sometime in the mid afternoon, so we had a few hours to kill. We got some food at this place called Beth’s…Apparently it was where Kurt Cobain used to eat breakfast or something…everyone kept telling us we had to go there. The thing I remember most is the bar next door had “Russell Crowe Drinks Here” on the sign…. After that the band decided to split up and meet back at the venue in an hour and a half. Just enough time to go on a hunt! The first place I went was this amazing video store called Scarecrow Video. It had a huge martial arts section of the likes a kid from Canada had never seen. I begged the guy at the counter to sell me a few. “Sorry, the stuff isn’t for sale.” And he gave me that look though his horn rimmed glasses that said I wasn’t the first to propose such a transaction. I headed out down the street and there was nothing except a few overpriced record shops and bookstores. Then at the end of the block there was this little nondescript doorway that led into a store with no name. The windows were caked with grime on the outside so it was impossible to see in. I cracked the door to look inside, and the two guys behind the counter looked at me, squinting like they had not seen daylight in hours. I’ll admit, it kinda felt like I was walking into the pawn shop in Pulp Fiction and that some leather clad gimp was going to pop out from behind a stack of old newspapers and no one would ever hear of me again. Then I could see, all the way in the back of the room, a wall of old VHS tapes, partially obscured by teetering stacks of books and records. I went inside. As I started looking, moving the enormous piles of dust ridden books aside as I made my way through the tapes, I started noticing that there was some kung fu in the mix. Mostly Bruce Lee and Jackie Chan flicks. This always makes my diggers intuition kick into gear. Sure enough, sandwiched between 2001: A Space Odyssey and Meatballs, was The Buddhist Fist! All I knew was I hadn’t seen it, and it looked pretty badass. I looked at my watch and it was time to get back to the venue, so I payed the two bucks they wanted for it and headed out the door, thankful to not have been gimped. For me the Buddhist fist is a great “Transition Period” film. 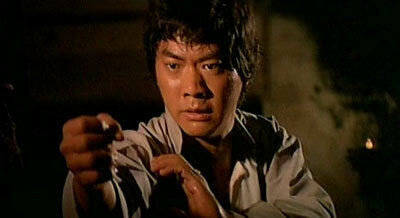 By the 80’s, kung fu cinema was changing. The traditional stop-and-move fighting styles were giving way to artfully choreographed plays that combined both martial arts and the acrobatics and high flying wire effects that would define the late 80’s/early 90’s films and would catapult actors like Jet Li and Jacky Chan on to international fame. 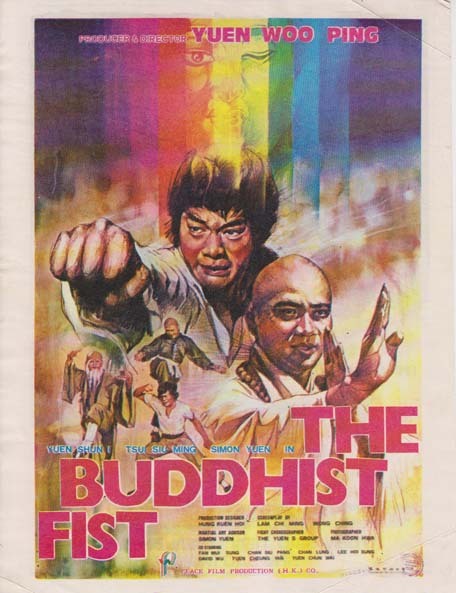 Buddhist Fist combines the classic storytelling and visual style of the 70’s with some early examples of Yuens Clan choreography and directing. Often considered one of the last great “Old School” kung fu films, it has it all: Humour, Drama, hunchbacks and most of all…great action scenes!